Toronto Argonauts quarterback McLeod Bethel-Thompson throws before a game against the BC Lions, in Toronto, on Aug. 18, 2018. 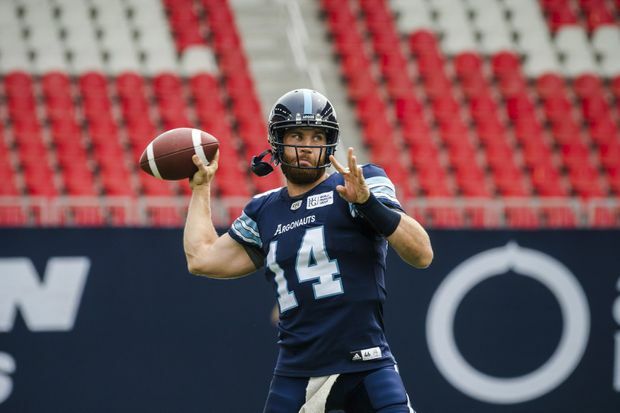 It’s crunch time for McLeod Bethel-Thompson and the Toronto Argonauts. Bethel-Thompson leads Toronto (3-5) into Hamilton (4-5) on Monday night to open an important home-and-home Labour Day series between the long-time rivals. The Argos will host the Tiger-Cats at BMO Field on Sept. 8. The Argos are third in the East Division. A sweep would not only move them into second but would also clinch the season series with the Ticats in the event of a season-ending tie. A split would leave Toronto behind Hamilton in the East with the teams scheduled to meet a third time Oct. 13 at BMO Field. But the Ticats can effectively take control of second spot with a sweep while still having two games remaining against the first-place Ottawa Redblacks (6-3). Toronto hasn’t enjoyed much Labour Day success in Steeltown. Hamilton leads the series 33-13-1 and is 4-0 at Tim Hortons Field. The Argos’ last Labour Day win in Hamilton was a 33-30 decision Sept. 3, 2012 at Ivor Wynne Stadium. East Division teams will likely have to finish 1-2 in order to secure a playoff berth. Toronto is currently two games behind both the Saskatchewan Roughriders (5-4) and Winnipeg Blue Bombers (5-5), which are tied for third in the West Division. If at season’s end the fourth-place team in the West has more points than the No. 3 team in the East, the Western squad will assume the Eastern conference’s third and final playoff seed. Bethel-Thompson rallied Toronto to one-point wins in his first two CFL starts. The Argos narrowly missed forcing overtime against Montreal as Zackary Medeiros’s 54-yard field goal attempt on the final play of regulation hit the upright. Bethel-Thompson finished 26-of-37 passing for 296 yards and a TD. Armanti Edwards was Toronto’s receiving leader with four catches for 114 yards and a touchdown. Toronto signed free-agent receiver Duron Carter this week but he won’t play in either game against Hamilton. And that’s unfortunate for a Toronto offence that rolled up 354 total yards against Montreal, the first time in five games the Alouettes’ defence hadn’t allowed more than 500 yards. Hamilton, meanwhile, rallied from a 24-10 deficit to beat Edmonton 25-24 at home Thursday night. Quarterback Jeremiah Masoli orchestrated the comeback with a season-high 419 yards passing, his 51-yard TD strike to Luke Tasker pulling the Ticats to within 24-22 with 2 minutes 37 seconds remaining to play. Hamilton took over at its 38-yard line with 1:32 remaining and Masoli moved the Ticats to the Edmonton 21. That set up Lirim Hajrullahu’s game-winning 29-yard field goal as time expired. Masoli is second among CFL passers with 2,884 yards and sports a 65.7-per-cent completion average. He has thrown more interceptions (10) than touchdowns (nine) but has registered seven 300-yard passing games this season. The Ticats are ranked second over all in passing (326.2 yards a game) and third in rushing (112.8 yards). Toronto counters with a defence that’s No. 8 against the pass (299 a game) and seventh stopping the run (111.9 yards). On positive note for Toronto, linebacker Bear Woods had a game-high nine tackles against Montreal in his season debut despite playing with a hand injury. At Ottawa, Antonio Pipkin will likely make a third straight start for Montreal (2-8) after passing for 303 yards and scoring two rushing TDs against Toronto. The Redblacks come off the bye having won two straight, and quarterback Trevor Harris has thrown for more than 300 yards in his past three starts. Over that span, Harris has completed 100 of 128 passes (78.1 per cent) and threw for 342 yards in a 28-18 win over the Als in July. At Regina, the Riders (5-4) chase a third straight victory having won 12 of their past 13 Labour Day home games against Winnipeg (5-5). Saskatchewan’s defence was stellar in last week’s 24-21 win over B.C., allowing just a second-half field goal. The Bombers have lost two straight, including a 39-26 decision last week to Calgary. The Stampeders held CFL rushing leader Andrew Harris to just 13 yards on seven carries. At Calgary, the Eskimos (6-4) look to do something no other team has this season – win at McMahon Stadium. The Stampeders (8-1) are 5-0 at home and have won six straight and 10 of their past 12 Labour Day home games versus their provincial rivals. Quarterback Bo Levi Mitchell, who threw for 452 yards and three TDs against Winnipeg, is 4-0 on Labour Day while Edmonton’s Mike Reilly, the CFL passing leader, is 0-3.